was considered a royal hacienda destined to the cult of the gods and a challenge to the ruling skills builder, built as a refuge for the elite of the Inca aristocracy, is considered one of the seven wonders of the world since 2007 and is located at 2430 meters altitude in the Urubamba river valley, visiting this place is for you an unforgettable experience ever imagined. Pick up from accommodation at 03:00 AM. Early in the morning transfer to the train station in Ollantaytambo. At 05:30 am elected board the train bound for the majestic sanctuary of “Machu Picchu”, since 2007 world wonder. During the tour we will appreciate the beauty of the valleys and the indigenous peoples of the area, up to Machu Picchu town, or better known as Aguas Calientes. Then we will take you on a tour bus to take us half an hour apróximamente the sanctuary. After rigorous check the admission booth, begins our unique experience in life, we are facing this amazing world heritage monument. 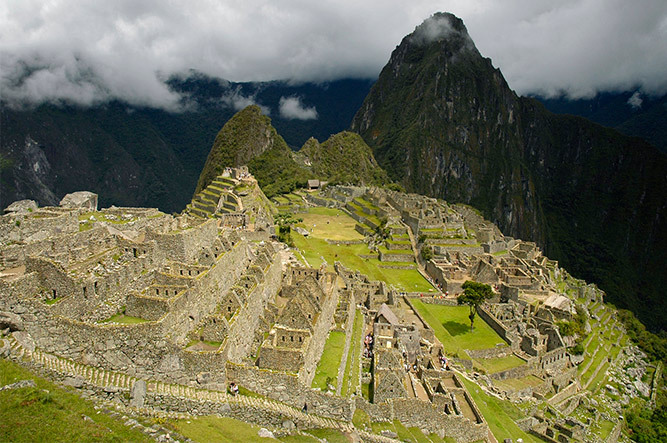 Our guide starts visiting the Inca complex, in the Temple of the Sun, where their main trade is observed, then the Intihuatana, the sacred rock group, Temple of the Three Windows, the mausoleum, among other places of interest for tourists . It gives the tourist a free time to do the photos, scroll on their own somewhere in your interest, among other things. In Machu Picchu town you can walk, go places selling crafts, Plaza de Armas and others, until the hour wait to board the train back to Cusco. At 08:00 PM. apróximamente. We will take the train back to Ollantaytambo bound where our tourist transport awaits to board the imperial city of Cusco, transfer to accommodation. End of our services. Not included in the Tour? For this type of trip is important to wear light clothing, long pants, hiking boots, sunglasses, sunscreen, hat because in the months of December to March the temperature can be between 8 and 22 degrees of heat depending on the altitude as this is rather warm and humid subtropical with warmth in the day and cool at night, during the day and there may be rain at this time, try to carry a poncho or umbrella in the winter months is important to wear a jacket and warm clothes in the cold this time may be more intense, if take a camera or camcorder not forget to bring a bag to protect from rain. If you want to make a reservation is important to send all personal information and payment required for this service, then our reservation department will send an e-voucher or receipt, which you must print and present to start the tour. NOTE: To make these services a person minimum is required and all prices are in dollars and are per person, any questions send an e-mail or please consult our prices here.